Japan says it will extend sanctions against North Korea for two more years, citing no progress in talks on abducted Japanese nationals. In July 2014, PM Shinzo Abe had said he was easing the measures amid hope of movement on the long-stalled dispute. But on Tuesday the government said Pyongyang had delayed reporting back on the issue. The issue is highly emotive in Japan and has been a major point of contention between the two nations, which do not have diplomatic ties. Japan has imposed its own sanctions on the North, which are separate from those imposed by the United Nations over its nuclear and missile tests. These include remittance and travel bans, as well as denying North Korean ships entry into Japanese ports. They had been due to expire on 13 April. The two sides agreed to reopen dialogue on the abductions in May 2014 and held several rounds of talks. It was reported that North Korea had agreed a member of its powerful National Defence Commission would sit on a special panel to re-examine the abduction cases. In July Tokyo eased sanctions, though no details were given of what restrictions were lifted. But since then no progress has been reported. Foreign Minister Fumio Kishida said North Korea had not yet reported the results of its investigation and said he was unaware of any progress made, NHK reported. The most high-profile of the eight is Megumi Yokota, who was kidnapped by North Korean agents on her way home from school in 1977, when she was 13. 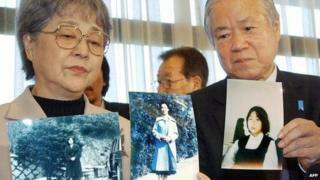 Pyongyang returned what it said were her remains in 2004 but DNA tests subsequently disputed that claim. Her parents have long campaigned for more information. Japan also believes that several other of its nationals were abducted and wants more cases to be investigated. Previous efforts at dialogue have ended in failure.